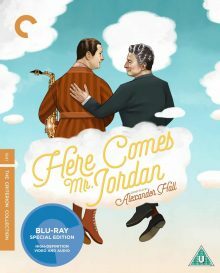 Here Comes Mr. Jordan is a film from 1941, based on a play called Heaven Can Wait, that spawned not only a sequel (Down to Earth in 1947), but a remake in 1978 (Warren Beatty and Buck Henry’s Heaven Can Wait), another in 2001 (Down to Earth starring Chris Rock) and even a remake in India in 1968 called Jhuk Gaya Aasman (English: The Skies Have Bowed). Some suggest it also helped kick start the mini-boom of guardian angel films in Hollywood during the 40’s and early 50’s, such as It’s a Wonderful Life and Angels in the Outfield. With the original film hitting the UK list of Criterion Collection titles today, the question is, does it still hold up today? 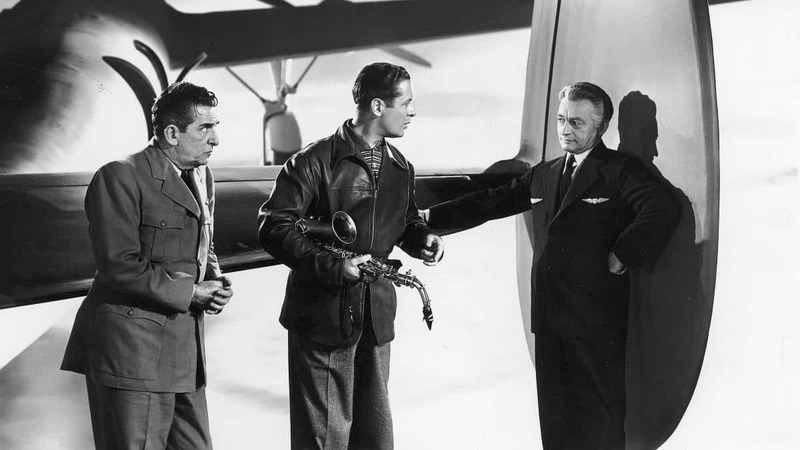 Here Comes Mr. Jordan tells the story of Joe Pendleton (Robert Montgomery), known as ‘the flying pug’ in his burgeoning career as a boxer. Whilst living up to his name and flying himself to his next fight, Joe crashes his plane and dies. His spirit is taken by messenger up to a cloudy runway to be flown up to heaven, but Joe complains to the angels that it isn’t his time and it turns out it isn’t. The messenger picked him up too early as Joe would have survived the flight and lived another 50 years. 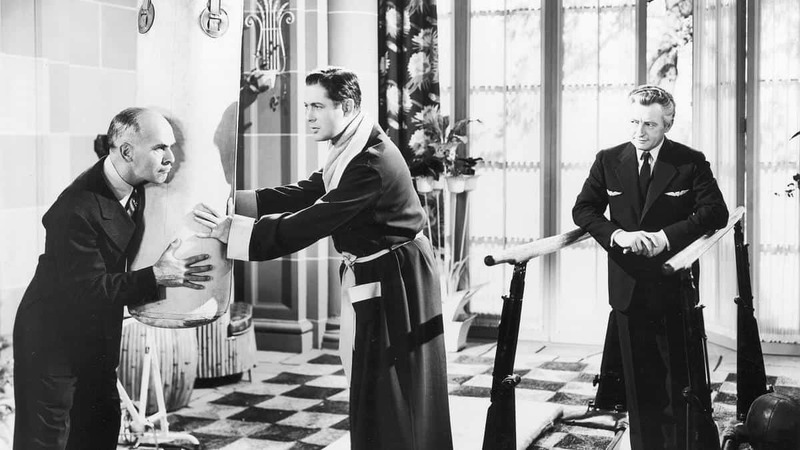 On learning that Joe’s body has been cremated, the angels, led by Mr. Jordan (Claude Rains), try to make up for the clerical error by allowing him to enter the body of someone else recently deceased. They pick out a crooked, wealthy businessman, Bruce Farnsworth, who’s just been murdered by his wife (Rita Johnson) and her lover. Joe is reluctant to take over this identity at first, until he meets Bette Logan (Evelyn Keyes), an attractive young woman who pleads to Bruce to help her father who he had sold worthless bonds to. Joe promptly chooses to become Bruce and pays the money back to all the small business owners he’d screwed over. This angers his business associates of course, but also his wife, so Joe has to work to keep this new body alive whilst wooing Bette and also trying to kickstart his boxing career in his new body. Without wanting to sound corny and over nostalgic, this is the sort of witty, charming Hollywood comedy they just don’t make anymore. Everything about the production has been polished to perfection, with no wasted frames as the film races through to its conclusion. Helping this rapid pace is a lead performance from Montgomery that’s full of energy and goofy charm. It’s hard not to love him as the simple but dedicated boxer, desperate to get back “in the pink” where he was before he died. Some of the supporting actors are equally as enjoyable, particularly the great Claude Rains who is smooth and cool as a cucumber throughout the film, seemingly relishing every minute of his work. Joe’s boxing coach Max Corkle (James Gleason) is great fun too, as he tries to get his head around Joe’s predicament (he’s the only living soul Joe confides in about his death). Like a lot of Hollywood comedies of the era, the script is pin sharp. It’s still laugh out loud funny 75 years on and does a great job of never letting the romantic sub-plot get in the way of the story or the humour. This is most apparent in a line from the messenger that breaks up a potentially soppy moment between Joe and Bette; “do we have to sit through this drivel?” (or something along those lines). I really enjoyed the concept of the film too. It’s been copied now of course, but it still feels fresh and fun. It also helps give the film a darker edge than expected. The scene where Joe waits in Bruce’s parlour whilst Mr. Jordan calmly, with a smile on his face, explains that Bruce is currently being drowned in the bathtub, is particularly dark. The denouement is interesting too as it’s a little bleak, but the script spins it into something sweetly sentimental and satisfying. The ‘rules’ of the film’s concept are over explained perhaps, but the exposition works when delivered to the slightly dumb protagonist. I loved every second of Here Comes Mr. Jordan. It’s fast paced, funny and pulls off its high concept with ease. It’s been remade several times, but you should stick with the original, because they absolutely nailed it the first time. Here Comes Mr. Jordan is released on Blu-Ray on 20th June in the UK by The Criterion Collection. The label doesn’t disappoint in its world renowned reputation for treating titles with the respect they deserve, presenting the film in its original aspect ratio and providing a print which is clean but natural-looking. The ‘conversation’ is a decent feature, neatly filling us in on the background behind the film and its reception. The Elizabeth Montgomery interview is fun. She’s friendly, in high spirits and has plenty of anecdotes to tell, although not loads about this film in particular. It makes for a fascinating look into the life of a Hollywood family though. I didn’t listen to the full radio play, but it was interesting to hear Cary Grant in the lead role, particularly as he’d been eyed up for the film version originally. With a dopey grin at parts.